After ten days in Forest City, Iowa it's time to hit the road. We've decided to take the scenic route to Colorado. We're heading north into Minnesota, then I-90 west through South Dakota to Buffalo, WY then southbound. 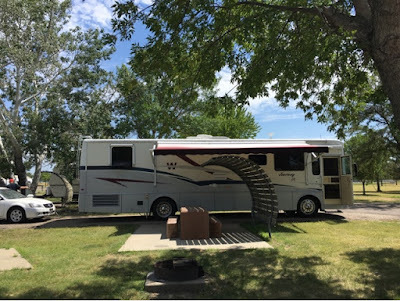 Our big stop is Rapid City, South Dakota to see Mt. Rushmore. 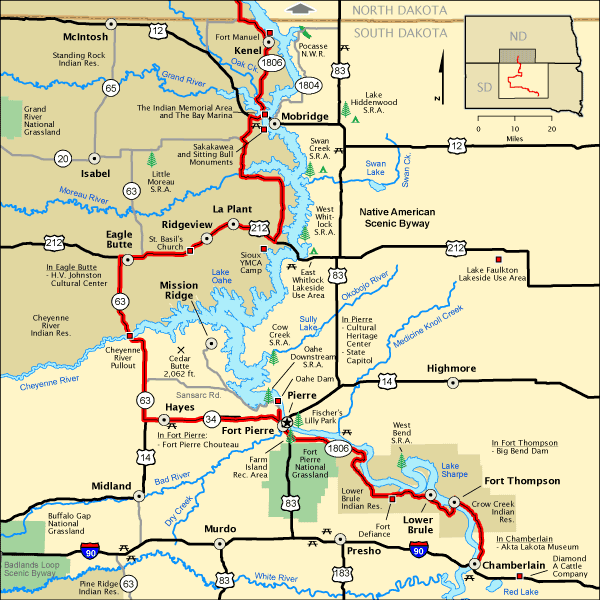 The tricky part of this route is that it puts us on the much traveled route to between Rushmore & Yellowstone. We usually like to wing dates and stops, but we had to make a few reservations for this trip. Specifically, because of the Sturgis bike rally the first week of August! (Insert joke here. We just crossed into #Minnesota. Check!)..." "We're streaming 93.7 Denver on iHeartRadio but our CoPilot navigation app keeps switching the music to Kenny Chesney. It took me awhile to convince The Colonel that it wasn't me!" Our first billboard for Wall Drug 355 miles. The rain delayed our departure but we got in 144 miles after lunch. 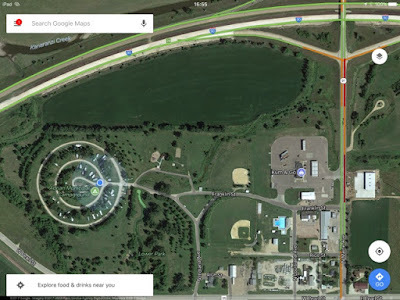 First stop is Adrian, MN Municipal Park Campground which is shaped in a circle! $30/night. We only stayed here for the night. It was easy access off the road, the staff was friendly and it was a quick in & out with a swing through the truck stop the next morning. I'm refraining from a full review, but the shape is either ingenious or weird. I couldn't decide. It does make your spot pie shaped which was tolerable but I could see how it could get tricky if the park was full. They also don't understand "pull-thru". We were able to pull through one spot into our spot without unhooking, but the dinghy hung into the spot behind us (which was empty). Not a true pull-thru--especially if they were full. "The Copilot took the wheel today! 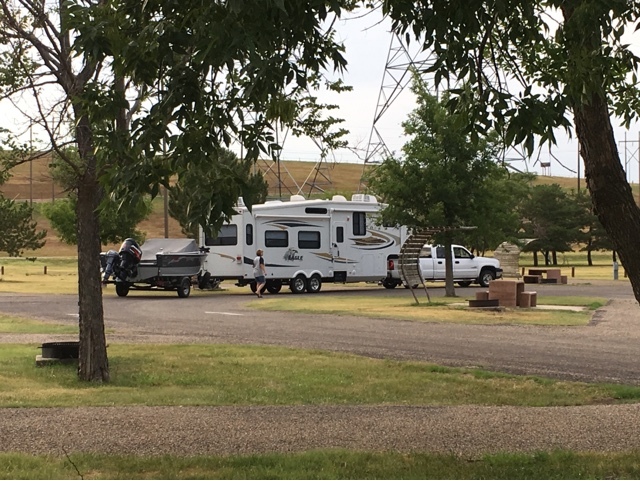 I drove from our campground to a rest stop (1 1/2 hours). Of course, we went into three different construction zones that involved lane changes, riding the right AND left hand lines and cones on our side of the line! Terrifying, but then the open road is SO much easier! It was equally terrifying for The Colonel but he was a good sport! 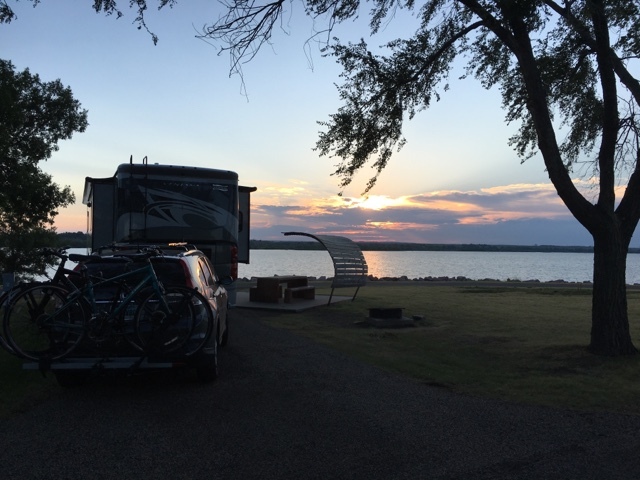 The campground in the middle of the Missouri River and below the dam! 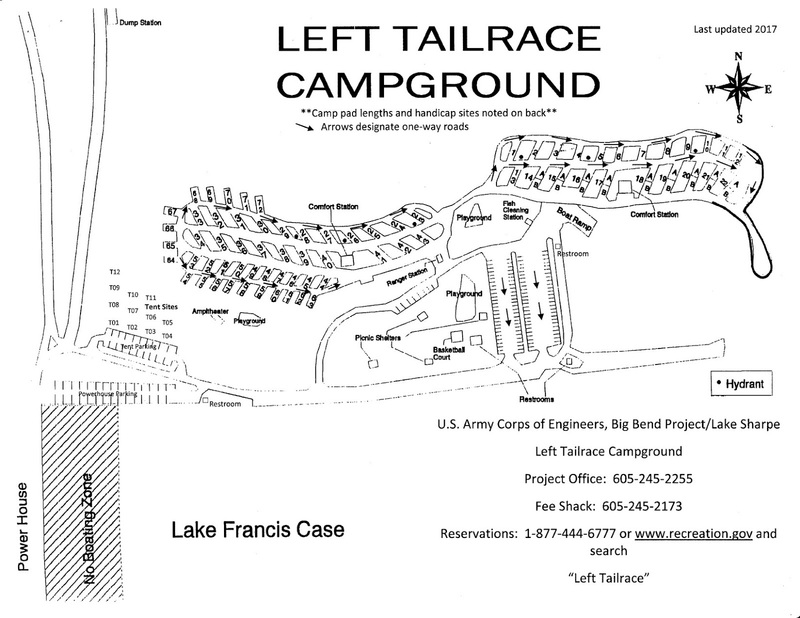 Headed to our first Corp of Engineers campground. Tours of the Big Bend Dam sealed the deal (there are more upriver if you want to explore). Recreation.gov only took reservations more than 24 hours in advance so I called before departing Adrian and were told, "Come on up! We have room. We'll let you in early." (Normal check in/out is 4:00 pm! We were able to get a reservation for the weekend when we arrived on a Thursday). Passed the exit for the Laura Ingalls Wilder house in DeSmet, SD. 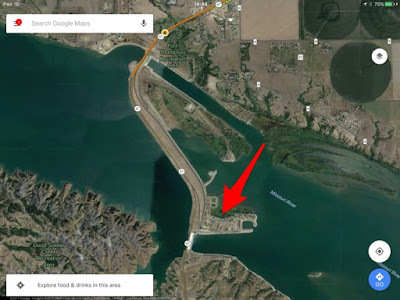 "We found the Missouri river, ya'll. We are not lost!" It's the furtherest we've wandered off the highway in search of the perfect spot (30 miles). 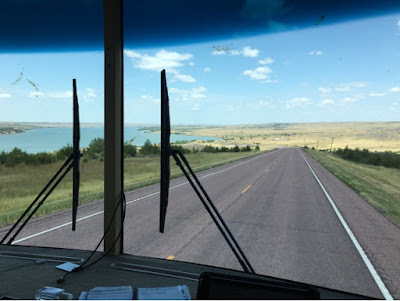 The rolling hills of South Dakota were breathtaking as we followed the Missouri River north, along a portion of the Native American Scenic Byway (https://www.fhwa.dot.gov/byways) through the Crow Creek reservation, to our campground. Directions: We had the GPS & directions from the Recreation.gov website but it was still a little confusing (recreation.gov below, italics are mine). They advise taking Hwy 50 up the east side of the river. This is the most scenic drive. However, we departed on Highway 47 & according to our Trucker's Atlas, it is an equally suitable road. 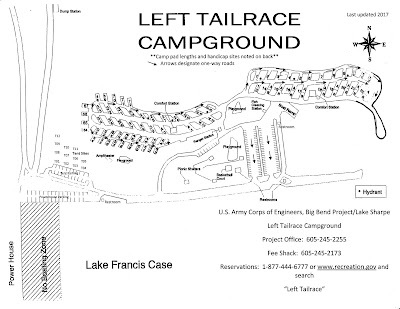 Then travel approximately 1 mile to the Left Tailrace Campground. (Not much signage but just follow the loop (camper’s & fishermen or marina signs) until you see the little log hut that is the campground office). Services: All sites 30 & 50 amp but only a few water spigots (so ask before entering). Dump Station on the way out. Our T-Mobile iPhones were roaming on AT&T (200 mb, no streaming) but immediately switched to T-Mobile at the top of the hill (next time we would drive up to parking lot across the highway & download some Netflix!). We were joined by lots of local fishermen over the weekend. We were in spot 51, a pull-through on the dam end but on a walk I discovered spot 12 is the primo spot with an amazing view of the lake, followed by 22A. A quick glance shows spots 23-26 (or 28-29) are within reach of the water spigot if you have a couple hoses. There is a two-week limit, but the cashier said there is a boondocking site “up the hill” that allows a two-week stay also. Big Bend Dam tour: Sorry, no pics allowed. The creepiest section was 109 ft below the lake, behind an 8 foot thick cement wall, below the generators. 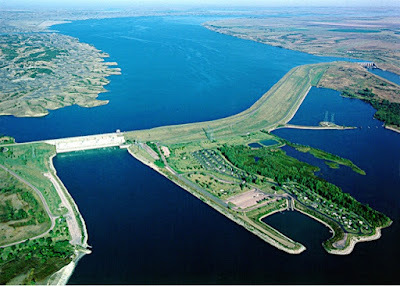 Be sure to walk along the water outside after the tour and see the HUGE fish right up against the dam. Lewis & Clark trail passes near here. We're from Missouri and kind of immune to the trail, so you're on your own with this one.